Sadly, children are not immune to foot and ankle problems. 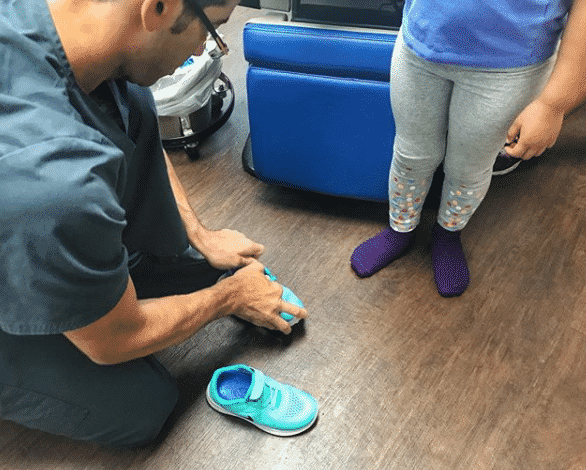 While many orthopedic (bone-related) issues resolve themselves as a child grows, other conditions can cause problems which need to be addressed by a trained podiatric professional. Flat feet. Most newborns don’t have arches in their feet, instead developing arches as they grow. But some children’s arches don’t fully develop, leaving them with “flat feet.” Understandably, parents who notice flat feet in their child may be worried that they will have mobility problems or challenges playing sports. Most often this is not the case, and whatever issues there are may be addressed with orthopedic shoe inserts. Only when the condition becomes painful or if it has become apparent that the child is having issues with their stride will a visit to the podiatrist be recommended. Toe Walking. As toddlers get the hang of walking, many of them walk on their toes. Usually, children grow out of this practice but some continue to walk on their toes long after they’ve learned to walk and stand upright. At that point children who appear to be walking on their toes most or all of the time should see a podiatrist. Persistent toe walking may be an indication of other conditions, such as cerebral palsy, muscle weakness disorders, autism, or other nervous system issues. In-toeing. Often referred to as being “pigeon-toed,” in-toeing is the inward turning of a child’s feet as they walk or run. Very common among younger children still working on their gait, in-toeing usually resolves itself in most children around the age of 8. If the condition persists, a podiatrist should be consulted. There are three main causes of in-toeing – metatarsus adductus, internal tibial torsion and excessive femoral anteversion – and the course of corrective treatment recommended by your doctor will depend on the reasons behind your child’s condition. As with the conditions listed above, bowlegs are very common among infants and toddlers and usually go away as the child gets older. A child is considered bowlegged if he or she stands with their toes forward and their ankles together while the knees don’t touch. Treatment for this condition is rarely needed, but if your child’s bowlegs persist after the age the age of 8 or so, consider visiting a doctor to ensure that your child isn’t suffering from other conditions that could be contributing to the issue such as vitamin D deficiency. For children and adults alike, foot and ankle problems can be painful and frustrating. At JAWS podiatry, we understand that you want to resolve any such problems as quickly and as easily as possible. We are here to get you back on your feet and back to your life. Please contact us today at (954) 922-7333 to schedule a consultation. With 26 bones, 33 joints and a whole bunch of tendons, ligaments and muscles, your feet have any number of ways that they can cause you pain, discomfort, and other problems. Many of these issues can usually be addressed through non-surgical treatments, including medication, lifestyle adjustments, or changes in footwear. Sometimes, however, when problems are severe or other treatments have not effectively resolved the problem, surgery may be necessary to get you back on your feet. Bunion Surgery. A bunion develops in a crooked joint that sticks out at the base of the big toe. Bunion surgery involves removing or realigning the soft tissue and bone in the area to bring the joint back into its correct alignment. In order to keep the bones in place, small screws, plates, or wires may inserted as part of the surgery. To heat or not to heat? That is the question we often face when we injure ourselves or experience pain in our feet or ankles. 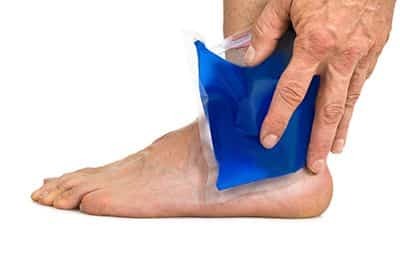 Both heat and cold can have beneficial effects such as reducing swelling or relieving pain, but not every kind of injury should be heated and not every pain should have you reaching into your freezer for a bag of frozen peas. 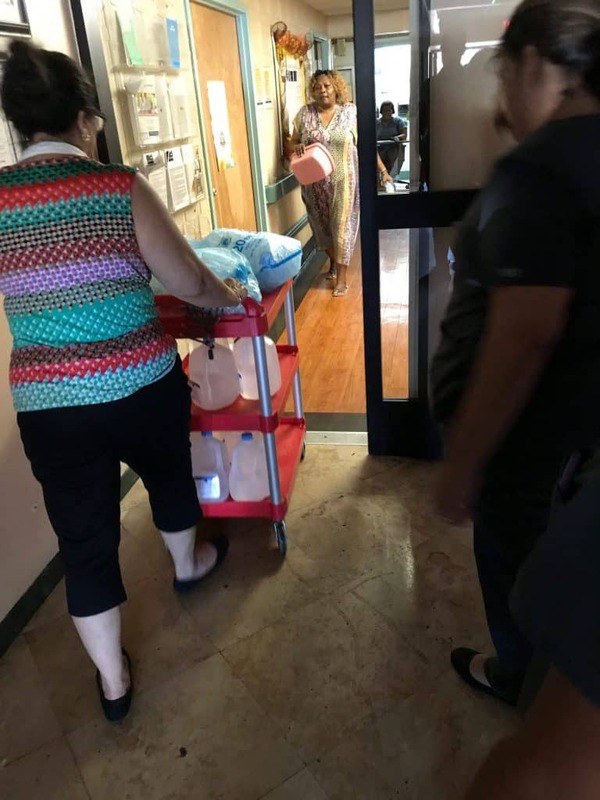 After the reported deaths in South Florida nursing homes all over the news yesterday the JAWS podiatry team jumped into action and visited a few of the nursing homes where we provide podiatric services and realized that the issue is that patients are suffering from the heat due to lack of electricity to power the A/C. The only solution, while FPL fixes the power lines, is ICE. 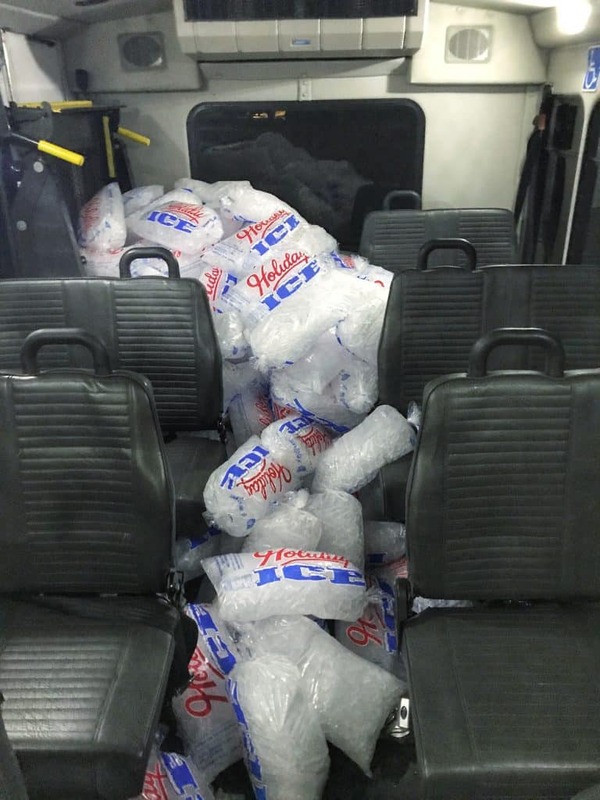 In the short-term, our team tried to scavenge the few bags of ice left around town. 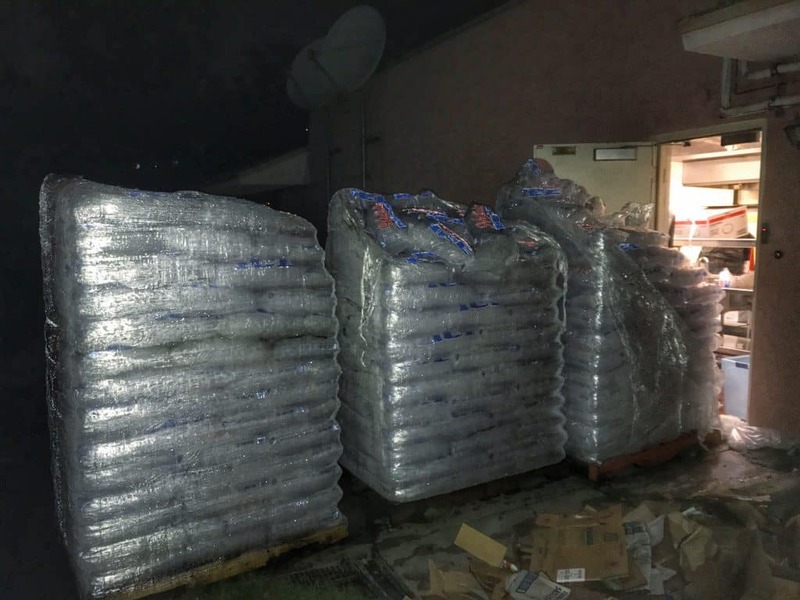 In doing so we realized that there was a desperate need for ice, and searched far and wide for hours until we were able to locate 600 bags of ice that a distributor was willing to sell, but could only drop off at one location. 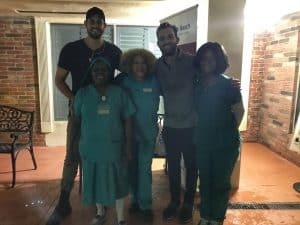 Once located we engaged City of North Miami Beach, Florida and North Miami Police to help us distribute the bags, before they melted, to over 1,000 patients and to the nurses who’s families don’t have power in their homes. It was a long night, but we got it done!! When we suffer an injury, our bodies have natural mechanisms which help us heal. Of course, if all we needed to quickly and effectively heal were our unaided bodies, we wouldn’t have much need for doctors, medicine, surgery, or other medical treatment. But that’s not the case. One treatment which has proven to be an effective healing therapy for a wide range of injuries and conditions involves taking one of those natural mechanisms and enhancing it to provide quicker, more effective healing. Called Platelet-Rich Plasma Therapy (PRP), this treatment has been around for many years and is a safe and painless way to help our bodies recover after injury or trauma. After an injury to soft tissue, the first response the body gives is to deliver platelet cells to the injured soft tissues. Platelets are the clotting cells of our blood, but they are also enriched with growth and healing factors that will initiate repair and provide assistance to stem cells in damaged muscle, tendon, and ligaments. PRP therapy takes that natural process and essentially turbocharges it. A sample of blood is taken from the patient and then placed in a centrifuge where the platelets are separated from other elements of the blood. That platelet-rich plasma is then injected into the injured tissue, stimulating the work that the body is already doing. 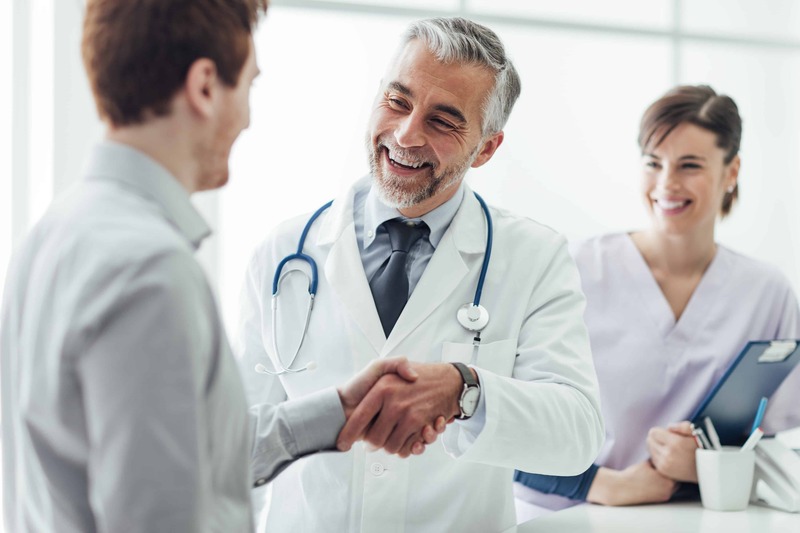 Whether on its own or in conjunction with surgery and other treatments, PRP offers patients the opportunity to reduce pain and speed up the recovery process after an injury. You should discuss with your physician whether PRP is right for you. At JAWS podiatry in Hollywood, Florida, we know how painful and frustrating foot or ankle problems can be. We also understand that you want to resolve any such problems as quickly and as easily as possible. That is why we utilize the most advanced techniques to reduce pain and speed recovery, including Platelet-Rich Plasma therapy. If you’d like to learn more about PRP or how we can help you with your foot and ankle issues, please contact us today at (954) 922-7333 to schedule a consultation. Nobody wants to go to the doctor if they don’t need to. That includes visiting a podiatrist, as wonderful as he or she may be. Indeed, many minor foot problems either resolve themselves or can be addressed with home remedies or over-the-counter medication. But not all foot or ankle problems are minor, and not every issue can be dealt with safely or effectively on your own. Sometimes, an appointment with a skilled and experienced podiatrist is the only way to fix what ails your feet or ankles. Making an appointment with a podiatrist does not mean you are making an appointment for foot surgery or that you necessarily have a serious problem. It simply means you are seeking the help of a highly-trained professional who can evaluate your situation and recommend the most effective treatment options. We are pleased to announce the launch of our brand new website! After months of hard work and dedication, we are delighted to officially unveil our brand new, creative, fun and user-friendly website. The redesigned site will serve as a central information hub for all things in podiatric care. JAWSpodiatry.com will also have an improved functionality with an added enhanced rich content focused on podiatric medicine/surgery, regenerative medicine, and pediatric foot & ankle care. Visitors will find weekly foot health and foot care articles on topics, ranging from Health & Wellness for Optimal Foot Care and Sport Injuries that Affect the Feet to Diabetic Foot Care and Regenerative Foot Care Medicine Research. How Does a Podiatrist Treat an Ingrown Toenail? An ingrown toenail is one of the most common – and painful – foot ailments we see at JAWS Podiatry. While ingrown toenails often heal on their own, many cases require treatment by an experienced podiatrist to fully address the problem. When a toenail digs into your skin it becomes ingrown and can cause a tremendous amount of pain. Shoe pressure, fungal infections, and clipping your toenails improperly can all lead to ingrown toenails. You can temporarily relieve discomfort by soaking your foot in a solution of lukewarm water and salt. However, that won’t take care of the underlying condition. If left untreated, a persistent ingrown toenail can have serious health consequences, including infections that can migrate to the tissue and bone near the nail. At JAWS Podiatry, our experienced podiatrists have several options for treating ingrown toenails. Which one will be recommended for you depends on the nature and seriousness of the condition, and whether it is an isolated issue or one that arises repeatedly. Lifting the nail. For nails which are only slightly ingrown, we can gently lift the ingrowing nail edge to separate it from the underlying skin, thus relieving the pain. We then place cotton, dental floss, or a splint under the nail to keep it away from the skin so that it can grow above the skin edge. Partially removal of the nail. If your ingrown toenail has progressed to the point of having redness, pain, and pus, we may choose to remove the ingrown part of the nail. This procedure may involve the use of a local anesthetic to numb your toe as the nail is removed. Full removal of the nail and tissue. For most people, having an ingrown toenail is an isolated incident and one that can largely be prevented with proper foot care. For some people, however, an ingrown toenail on the same toe can be a repeating, chronic problem. In such cases, we may recommend not only removing the nail but the underlying tissue as well using a chemical or fine laser. After any of the foregoing procedures, you will need to take care of the effected toe to prevent infection and encourage healing. This may involve cleaning the wound and soaking in Epsom salts and/or anti-microbial soap every day for a couple of weeks, as well as the application of an antibacterial cream and small bandage. We also recommend wearing open-toe or loose-fitting shoes to keep pressure off the toe while it heals. If you are suffering from an ingrown toenail or are having any other problems with your feet or ankles, the experienced and skilled podiatrists at JAWS Podiatry in Hollywood, Florida can help. 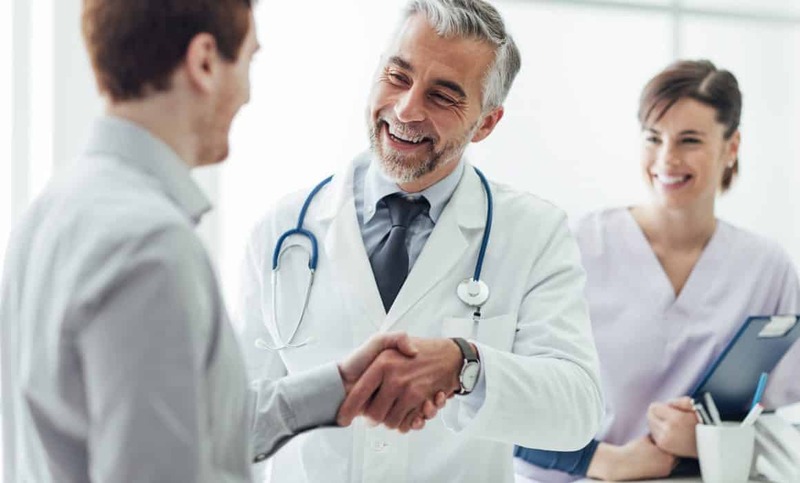 While our foot and ankle specialists will explore all possible alternatives to see if a non-surgical solution can address your problem, we are prepared when necessary to address your issues with surgery performed with the highest standard of care. Please contact us today at (954) 922-7333 to schedule a consultation. Can I Remove Calluses From My Feet? Calluses are compressed dead skin cells that develop on the bottom of the feet due to irritation and the pressure caused by the thousands of steps we take every day. Calluses are usually not harmful, but may sometimes lead to other issues, such as infection or skin ulceration. At JAWS Podiatry, we are often asked whether calluses can be removed at home without having to see a doctor. If the calluses are not infected and are relatively minor, the answer is yes. However, if they are extremely swollen and painful, you should make an appointment with an experienced podiatrist who can remove them for you and help you avoid potential complications. Soak your feet in warm water with a handful of Epsom salts for about 10-15 minutes to soften the skin. Once the dead skin has softened, use a wet pumice stone or callus file in a vigorous circular motion to gently rub off the top layers of skin. Rinse your feet often by dipping them back into the warm water, and rinse the pumice stone regularly as well. Dry your feet thoroughly when you’re done. Repeat the process on a daily basis until all of the dry and dead skin is gone, and apply moisturizing lotion. Do NOT ever use a razor blade, knife, scissors, or any other sharp object in attempting to remove a callus as doing so could lead to injury or infection. If you are suffering from calluses or are having any other problems with your feet or ankles, the experienced and skilled podiatrists at JAWS Podiatry in Hollywood, Florida can help. We offer the highest degree of care in a welcoming, comfortable environment. Please contact us today at (954) 922-7333 to schedule a consultation. Sandals, flip-flops, or barefoot – summertime means that your feet are in the sun and in full view. With all the summer fun you’re having, you want your feet to be in great shape and looking good. Here are are three easy ways to get and keep your feet soft, beautiful, and healthy this summer. Calluses are compressed dead skin cells that develop on the bottom of the feet due to irritation and the pressure caused by the thousands of steps we take every day. Calluses are usually not harmful, but may sometimes lead to other issues such as infection or skin ulceration, and they are certainly not attractive when you’re kicking your feet up at the beach. If calluses are not infected and are relatively minor, you can remove them yourself. Soak your feet in warm water with a handful of Epsom salts for about 10-15 minutes to soften the skin. Once the dead skin has softened, use a wet pumice stone or callus file in a vigorous circular motion to gently rub off the top layers of skin. Rinse your feet often by dipping them back into the warm water, and rinse the pumice stone regularly as well. Dry your feet thoroughly when you’re done, repeat the process daily until all of the dry and dead skin is gone, and apply moisturizing lotion. If, however, your calluses are extremely swollen and painful, you should make an appointment with an experienced podiatrist who can remove them for you and help you avoid potential complications. Walking barefoot on the beach, around the pool, and in the restrooms and locker rooms nearby is almost unavoidable during summer. It’s also almost unavoidable that doing will expose your feet to the bacteria and fungus which breed in such moist, dirty, and heavily-trafficked areas. This includes toenail fungus, which may cause your nails to become discolored, thick, brittle, and separated from the nail bed. Soaking your foot in a solution of lukewarm water and salt can relieve pain, but treatment of the problem involves either topical or oral anti-fungal medications. Over-the-counter anti-fungal creams can help, but often are not as effective as prescription anti-fungal drugs your podiatrist can provide. Prescription treatments such as terbinafine (Lamisil) and itraconazole (Sporanox) can help replace infected nails with new nails which grow free of infection. While effective, these treatments may take four months or longer to fully eliminate an infection. A bunion develops in a crooked joint that sticks out at the base of the big toe. The problem can arise from heredity, congenital deformities, or injury, and when that crooked joint is confined to a shoe, painful bunions are often a result. Changing into loose and open summer footwear and pain relievers can help ease the pain and discomfort, but bunion removal and surgery may be required to fully address the problem. No matter what the season, you want to keep your feet comfortable, healthy, and attractive. The experienced and skilled podiatrists at JAWS Podiatry in Hollywood, Florida can help. We offer the highest degree of care in a welcoming, comfortable environment. Please contact us today at (954) 922-7333 to schedule a consultation.